This article takes a somewhat different approach than my others. I will explore Powerplay and Penalty Kill stats from last season and over the past 4 seasons. What is considered a "good" Powerplay? Penalty Kill? How do we figure this out? I gathered Powerplay stats from last year at NHL.com and compared them to each team's total overall points from last season in search of any correlation between the two. All teams to the right of the "90" mark along the X-axis made the playoffs. The highest team Powerplay % last year was a tie between the Washington Capitals and Pittsburgh Penguins, both had a 23.4% Powerplay, but only one made the playoffs. The average Powerplay % from last season was 17.9%, with a standard deviation of 2.75%. So, using my definition of "above average", "good", and "elite" from my last article (good being 1 standard deviation or more above the mean, and elite being 2 standard deviations above), let's see who was what. A team with a Powerplay % over 17.9% would have an above average Powerplay. A team with a "good" Powerplay would have a stat of 20.65% or greater. For an "elite" team, their Powerplay percent would be 23.4% or greater. From this definition, there were two "elite" Powerplay units last season, Pittsburgh and Washington. I will address shot totals a little later in the article. But in the mean time, let's look at last season's Penalty Kill stats. Above the 83% mark along the X-axis, 9 of the top 12 teams made the playoffs. The highest Penalty Kill% in the league was the New Jersey Devils, at 86.4%, and yet they didn't make the playoffs. The correlation between the data points on this distribution is even lower than the correlation of the graph before this. The average penalty kill from last season was 82.08%, with a standard deviation of 2.4%. With these numbers, we can determine that a team would need a Penalty Kill% higher than 82.08% to have an "above average" stat. A "good" team would have a Penalty Kill% of 84.48% or greater. For an "elite" Penalty Kill stat, a team would have to have 86.88% or greater. With these parameters, there were no "elite" Penalty Kill teams from last season. New Jersey missed out on "elite" by 0.48%. Okay, so how does this recent season's special teams stats compare to the last 4 seasons? This is important because the sample size is much greater than 30 teams. 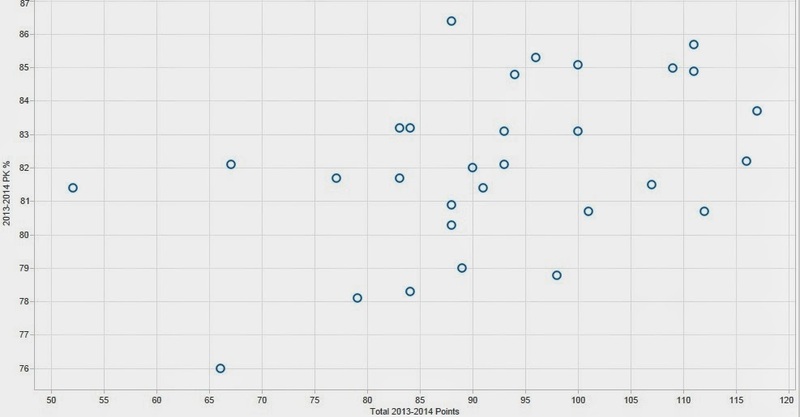 I had to make this graph in Excel, and take out seasonal point totals due to the partial lockout season of 2012-2013. For the sake of clarity, I will view each specific point on the distribution as a team, as if there were 120 individual teams, and the only differentiation between two of the same teams will be the year. To avoid any confusion, the data points are plotted in descending order, and the label of the X-axis is just the team count. The highest percentage is the 2012-2013 Washington Capitals, at 26.8%, and the lowest percentage was the 2013-2014 Florida Panthers, at 10%. The average Powerplay % was 17.84%, with a standard deviation of 2.76%. For categorizing special teams over the past 4 seasons, a team would need to have a Powerplay stat higher than 17.84% in order to have an "above average" Powerplay. For a "good" Powerplay, a team would need a stat of 20.6% or greater. For an "elite" Powerplay, a team would need a stat of 23.36% or greater. In this case, there are 7 "elite" Powerplay teams from the past 4 seasons, 2013-2014 Washington Capitals, 2013-2014 Pittsburgh Penguins, 2010-2011 Anaheim Ducks, 2010-2011 San Jose Sharks, 2010-2011 Vancouver Canucks, 2012-2013 Pittsburgh Penguins, and 2012-2013 Washington Capitals. Let's look at Penalty Kill stats over the past 4 seasons. Like the graph above, each point is viewed as an individual team. 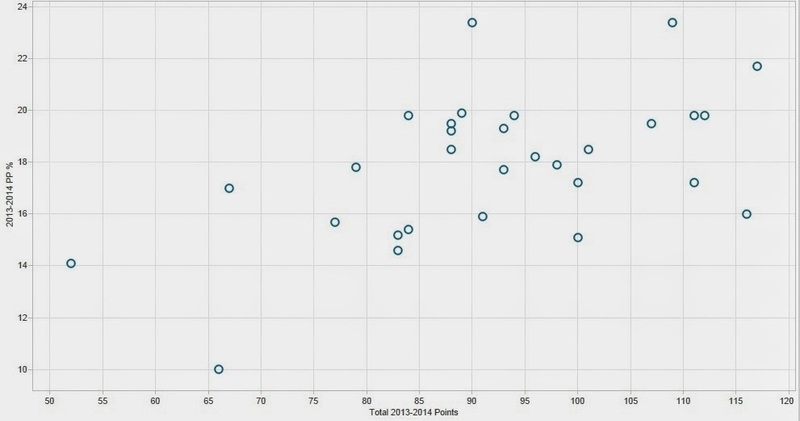 The average Penalty Kill% over the past 4 seasons is 82.09%, with a standard deviation of 3%. So, a team would need a Penalty Kill higher than 82.09% to be considered "above average". For a "good" Penalty Kill, a team would need a stat of 85.09% or greater. For an "elite" rank, a team would need to have a Penalty Kill of 88.09% or greater. This means there were only two "elite" Penalty Kill teams over the past 4 seasons, 2011-2012 Montreal Canadiens, at 88.6%, and 2011-2012 New Jersey Devils, at 89.6%. I think another interesting way to look at the effectiveness of Powerplays is the shooting percentage. The highest percentage from last season was the Tampa Bay Lightning, who had a 15.3% (The New Jersey Devils were a close second place with 15.2%). The average Powerplay shooting percent last season was 12.37%, with a standard deviation of 1.86%. An "above average" Powerplay shooting percent would need to be higher than 12.37%. A "good" Powerplay shooting percent would need to be 14.23% or greater. An "elite" Powerplay shooting percent would be 16.09% or greater. At this rate, there were no "elite" Powerplay shooting% teams last season. Comparing this to the stats over the past 4 seasons, the top shooting percentage was the 2012-2013 Washington Capitals, with an astounding 20.2%. The overall average Powerplay shooting percent from these seasons was 12.7%, with a standard deviation of 1.93%. An "above average" Powerplay shooting percent would be 12.7% or greater. A "good" Powerplay shooting percent would be 14.63% or greater. An "elite" Powerplay shooting percent would be 16.56% or greater. From this definition, there have been 5 "elite" Powerplay shooting percent teams in the past 4 seasons, 2011-2012 Edmonton Oilers, 2012-2013 Los Angeles Kings, 2012-2013 Edmonton Oilers, 2011-2012 Nashville Predators, and 2012-2013 Washington Capitals. Of the 5 "elite" Powerplay shooting percent teams above, the 2011-2012 Edmonton Oilers were 3rd overall in the league, the 2011-2012 Nashville Predators were 1st overall in the league, the 2012-2013 Los Angeles Kings were 10th in the league, the 2012-2013 Washington Capitals were 1st overall in the league, and the 2012-2013 Edmonton Oilers were 7th overall in the league. So a high shooting percent on the Power Play is imperative to success. One more thing to note: The two highest Powerplay shot totals over the past 4 seasons have been by the San Jose Sharks: 572 in 2010-2011, and 505 in 2013-2014. Yet, their Powerplay was 2nd overall (in 2010-2011) and 20th overall (in 2013-2014). The 2013-2014 San Jose Sharks Powerplay unit was 27th overall in the league in shooting percent, at 9.9%. The team in 2013-2014 with the 2nd most Powerplay shots was the Washington Capitals (469 shots). Yet, the Caps' Powerplay shooting percent was 14.5%. At what point is the Powerplay luck? Or is Alex Ovechkin just the league's best Powerplay forward? These are all points in which I will write further about later. So yes, this post was a little different than my others. I just wanted to look into some recent numbers. Let me know what you think! I'd love some feedback, and to keep updated on my new posts, follow my Twitter account @DTJ_AHockeyBlog! I think I understand Penalty Kill % (the number power plays where no goal is scored against divided by the total number of power plays), but I don't think I understand PP% or PP Shooting %. Can you explain those? Yes, the Penalty Kill% is the percentage of penalties killed versus goals given up while on the penalty kill. (i.e. if a team faced 18 penalties, and gave up 2 goals from them their penalty kill would be 88.89%). The Powerplay % is determined by number of times a team scores a goal versus number of times on the powerplay. (i.e. if a team has 24 powerplays, and scores a goal on 6 of those opportunities, they would have a powerplay of 25%).